ICAR-CIFT organized an international training programme on “Extension Management Techniques for Up-scaling Technology Dissemination in Fisheries” from 9-22 November, 2018 for the capacity building of extension/ development/ research personnel of different countries with recent technological advancement in the field of harvesting and post-harvesting in fisheries blended with innovative extension approaches, extension management techniques for effective technologies dissemination to the end users. 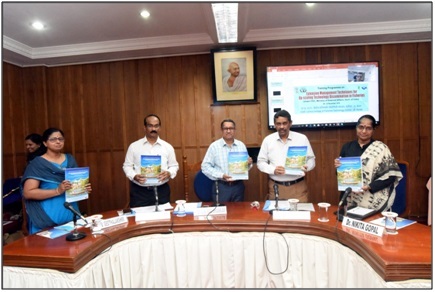 The institute registers the unique distinction of conducting such prestigious International training programmes in fisheries under Indian Technical & Economic Cooperation (ITEC), Ministry of External Affairs, Govt. of India. Twenty senior government officials from fourteen developing countries namely Algeria, Guatemala, Mauritius, Oman, Sri Lanka, Sudan, Syria, Tanzania, Tunisia, Uganda, Zimbabwe, Malawi, Afghanistan and Bangladesh spreading over, Asia, Africa and North America attended the fourteen day international training programme. The valedictory function of the programme held on 22 November, 2018 which was graced by Chairman, Marine Product Export Development Authority (MPEDA Shri. K S Srinivas (IAS)) as the Chief Guest. Lauding the significant achievements of ICAR-CIFT in harvest and post-harvest sector, the Chief Guest called upon the participants to utilize the skill and knowledge gained through this apt training for the fishery sector development in their country. Being impressed with the research accomplishments of ICAR-CIFT, he expressed his desire to work in convergence with ICAR-CIFT to boost up the fishery exports of the country. Appreciating the enormous response of the overseas participants for the programme, Dr. C N Ravishankar, Director, ICAR-CIFT conveyed his gratitude to Ministry of External Affairs, Govt. of India for sponsoring this programme and emphasized on the notable research achievements of institute including NABL accredited laboratory facilities and FSSAI Reference Lab that may lead the blue economy growth in India. Dr. A. K. Mohanty, Head, Extension Division and Course Director in his welcome address briefed about the background of the programme and highlighted the importance of extension in technology diffusion to exploit technologies for development. Earlier, Shri Dinkar Asthana (IFS), Addl. Secretary, ITEC, MEA, Govt. of India interacted with trainees through Video Conferencing and asked the feedback regarding the programme. Dr. Nikita Gopal, Principal Scientist presented the course report and Dr. V. Geethalakshmi, Principal Scientist proposed vote of thanks. 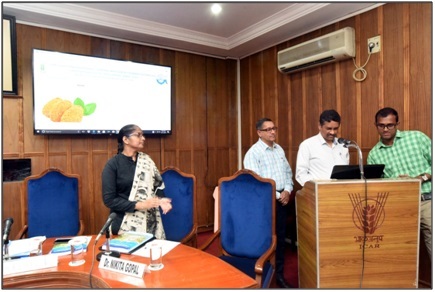 On this occasion, the Chief Guest launched a web based interactive information system on CIFT value added fish products entitled “CIFTFISHPRO” developed by ICAR-CIFT, which provides information on series of values added fish products and it is accessible through http://ciftfishpro.cift.res.in/.